Wondering what to eat for lunch today, I decided to skip a tired, frozen entrée (yawn.) I had to do bit of work on my raised vegetable bed anyway. The Swiss Chard wasn’t going to thin itself. I opted this year to purchase 6 packs of veggies starts for more immediate gratification. Yes, starting from seeds takes a bit longer. 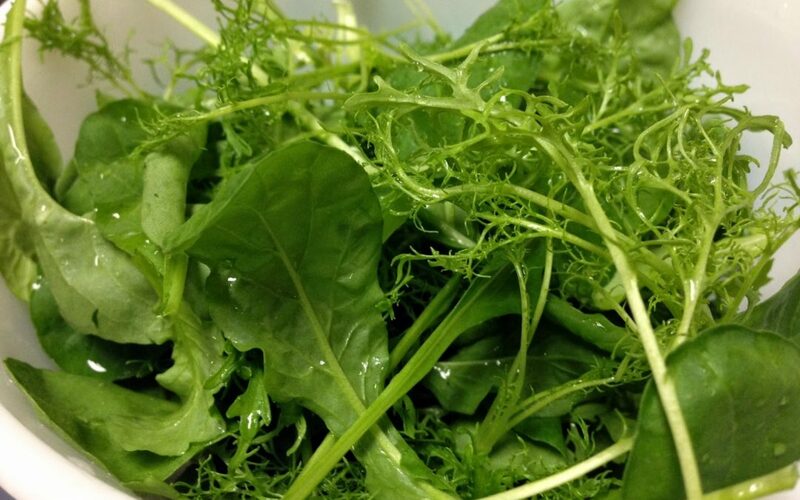 So, after several weeks in the ground of my edible garden landscape design, my Kale, Spinach, and Red Leaf Lettuce were producing enough to harvest. Kale is a new crop for me, so I had to look up some recipes. I didn’t see one that I wanted to try, so I pursued my own. In addition to all these freshly harvested greens, I still had a dozen or more ripe mandarins on my dwarf tree in my backyard garden. Its amazing how one can be eating healthy from your own backyard with thoughtful landscape design. 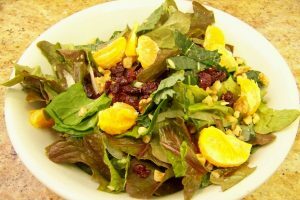 So after rinsing all the greens, peeling a mandarin, adding craisins, chopped walnuts, and a bit of onion I had the most enjoyable, delicious and extremely healthy lunch. Oh, and I added a can of tuna for some protein on the side. That’s entirely optional depending how hungry you are. Living in San Diego, edible garden landscape design is very popular and encourages healthy eating. I encourage my clientele to place raised beds in their landscape designs. I find growing winter vegetables nearly fool proof. Summer crops can be more challenging with either too much sun or critters. I do have to admit, I did find some aphids on my new Kale crop, so out came the spray bottle with a bit of dish washing detergent and soon the aphids will be history. I’ll have to keep a vigilant watch to make sure they are fully eradicated. Along with the above mentioned leafy greens, I also have Broccoli, Brussel Sprouts, Peas and Onions. Fortunately I have neighbors who eat healthy so I can enjoy sharing what I grow. And even better my next door neighbor’s multiple chickens are laying every day, so I can enjoy fresh eggs to go along with the rest of my bountiful harvest. Please contact me to learn how you can enjoy the benefits from an “At Home Harvest.” Letz Design Landscape does specialize in edible garden landscape design. So I do have to practice what I preach. We are after all, what we eat. What are you today? Are you ready to be eating healthy?